Wat Boon (วัดบูรณ์) is known locally for its old (possibly Lan Chang era) brick stupa, which is now covered by a modern one. 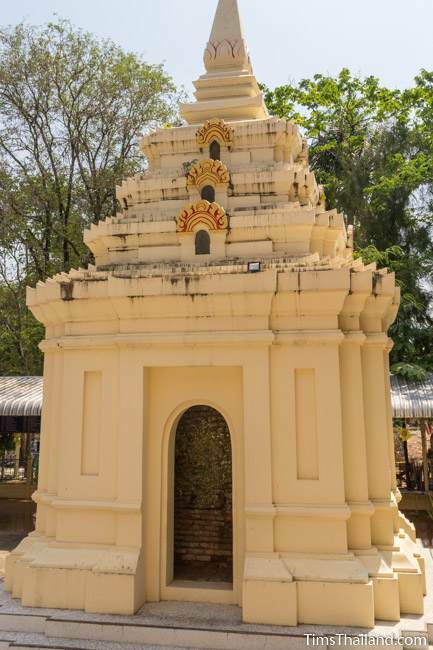 But, before the Lao came there was a Khmer temple of unknown era and design on this site. There are no Khmer structures remaining, just a few blocks, almost all laterite, which you barely notice since they're used to line walkways next to the ubosot and stupa. The only one that's obviously part of a Khmer temple is a sandstone section of a door frame. 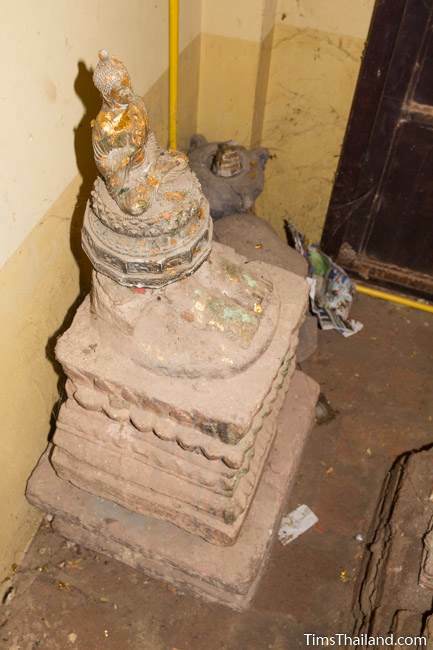 Also, inside the stupa is a base of a broken statue with only the feet remaining that could be Khmer, although Khmer statue bases normally have smooth straight edges. 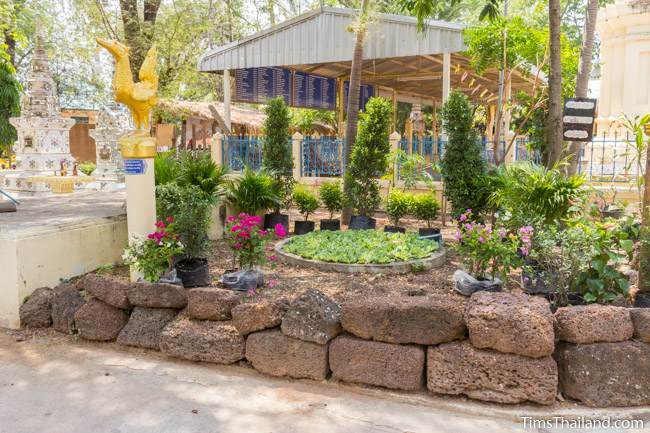 A singha statue presumed to be Khmer was also found here, but it's not on display. City leaders established a Buddhist temple here in the early 19th century. According to engraved gold and silver sheets found inside the brick stupa, they began by building a Buddha image within the remains of the Khmer prang. Later, most of the laterite blocks were used to build a base for a new ubosot. 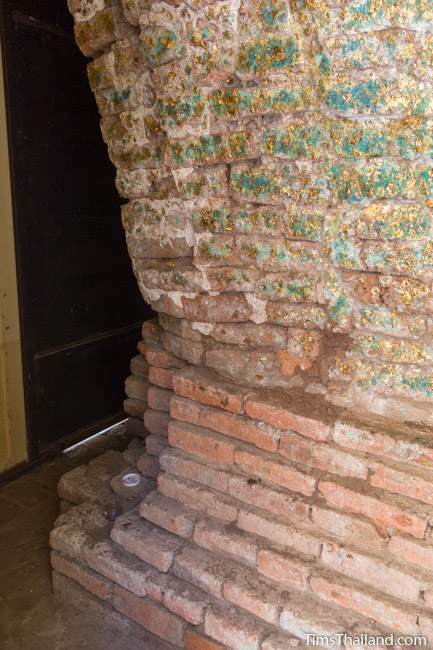 Some people have said that the historic stupa was built using bricks previously part of the prang. 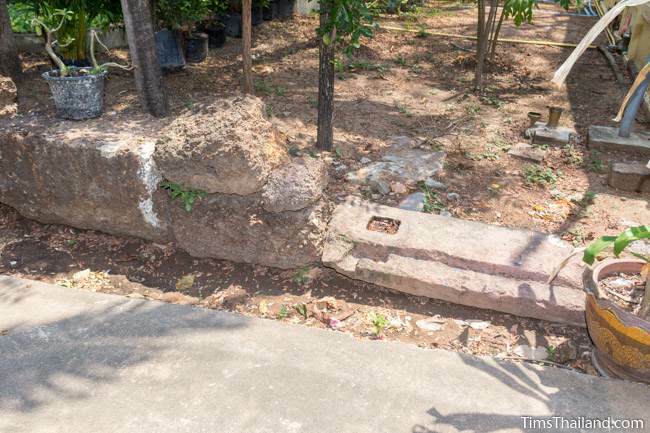 Though it can't be confirmed, if this is correct, it would suggest that the Khmer temple dates to the 11th century, which is when Ku Daeng, which used brick for its prang, was built. 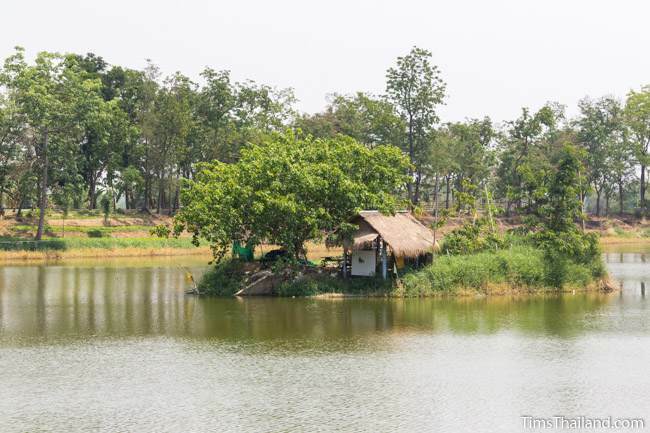 On the east edge of the temple is the baray, which has been excavated in modern times for use by the village. The small island (which would not have been there in Khmer times) holds a holy Buddha image from the King Rama IV era. Other names – Sometimes transliterated as Wat Bun.